A markedly cooler, more arid climate began in the Eurasian steppes from western Russia into the Altai ca. 2500 BC, reaching its coolest and driest peak ca. 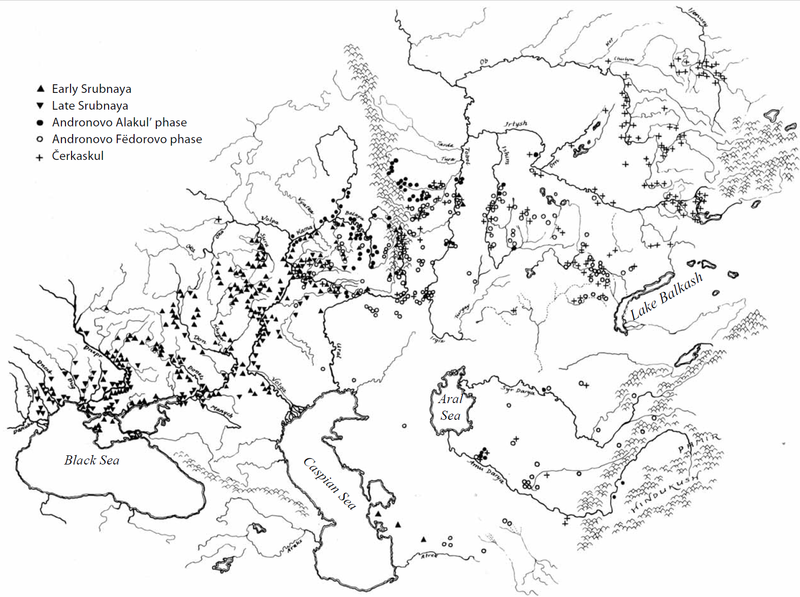 2250–2000 BC, creating a paleoecological crisis had a significant effect on the economy of Pontic–Caspian tribes, favouring higher mobility and an almost complete transition to nomadic pastoralism (Demkina et al. 2017). In the Volga–Ural region, forests, lakes, and marshes declined in area and steppes expanded. In northern steppe pastoralism, the most critical resource was winter fodder/grazing and protection from winter ice and snow. This may have led to increased competition for winter access to declining marshes, with mobile herding groups struggling to permanently settle near the most vital resource, in a sort of child’s game of musical chairs (Anthony 2016). In the period around 2400–2300 BC, there is a clear interaction between mobile steppe herders of the Poltavka culture and forest-steppe groups of the Abashevo culture. This interaction is evidenced in the subsequent period by the emergence ca. 2100 BC of Sintashta in the Ural–Tobol steppes, Potapovka in previous Poltavka territory, and Filatovka in the upper Don (Suppl. Fig. 12). Sintashta east of the Urals and the Multi-Corded Ware culture west of the Volga were the first to settle in permanent locations near marshes (Anthony 2016). These traditions continue in an early phase the previous Abashevo pottery, but also retained and gradually expanded many cultural traits of Poltavka pottery, followed the same burial rites, and settled on top of or incorporated older Poltavka settlements. “It is difficult to imagine that this was accidental. A symbolic connection with old Poltavka clans must have guided these choices” (Anthony 2007). This transformation was accompanied by an “unprecedented level of population mixing and interregional north–south movement across the steppe/forest-steppe border in the Middle Volga steppes”, which is evident in shared material culture—projectile point styles, pottery, bronze weapons—closely associated with technical innovations in warfare, sign of increasing interregional stress (Anthony 2016). The Sintashta–Potapovka warrior societies were born from a time of escalating conflict and competition between rival tribal groups in the northern steppes, where raiding must have been endemic, and intensified fighting led to the invention of the light chariot (Anthony 2007). The state of intense warfare was caused by a constant flow of wealth, originating from long-distance metal trade, with formation and destruction of alliances and gathering of large groups of warriors, which created a vicious circle of escalation of conflict, and created new customs, new tactics, and new weapons (Pinheiro 2011). These harsher conditions and warrying period may also be reflected in demographic trends, with Sintashta–Potapovka cemeteries dominated by children (51%), and the population possibly affected by outbreaks of infectious diseases from domestic animals. However, this trend could simply reflect a cultural change whereby children were included in the burial rite (Khokhlov 2016). The low proportion of deaths caused by violent injuries, and the high subadult mortality—population below 18 years representing up to 75% of buried individuals—further support the scarcity of resources as the most prevalent cause of death, at least in populations around settlements (Judd et al. 2018). Most Sintashta–Potapovka kurgan burials present large central burial pits, accompanied by abundant sacrificial remains in the form of skulls and limbs of horses, large and small cattle, rich funeral complements including bronze tools and weapons, artefacts of metal production, and objects related to chariots (Kitov, Khokhlov, and Medvedeva 2018). One of the defining innovations of this period was probably the use of chariots driven into battle, as evidenced by an experimental study on use-wear of Sintashta–Petrovka shield-like cheekpieces, designed to be used with the teamed chariot horses for two-wheeled vehicles driven on the steppe (Chechushkov, Epimakhov, and Bersenev 2018). This improvement in warfare may have helped the expansion of these and succeeding Eurasian steppe cultures, and the rise of elites among them. Warring groups were strong enough to take and destroy an entire settlement, signalling an age of fully-fledged conflict, with a succession of changes in the defence systems and planning schemes of the settlements, which caused the concentration of the previously dispersed Poltavka mobile herder population around such fortified settlements to the east of the Urals (Anthony 2016). The Sintashta culture is characterised by carefully laid-out circular shaped settlements (Figure 81) paired with recognisable kurgan cemeteries, and prominent warrior graves furnished with weapons and chariot grave goods. All Sintashta settlements were built near low spots on banks of small steppe streams, usually on the first terrace of a marshy, meandering stream close to winter grazing, in spite of the obvious concerns for security. In the Middle Volga steppes, similar settlements—with a preference for low terraces beside the wet floodplain, preferably behind a large marsh—begin later, ca. 1900 BC (Anthony 2016). Figure 81. Description of archaeological site of Arkaim, Russia (Wikipedia). The chronology of Sintashta–Petrovka is short, about 300 years, and can be divided into an earlier Sintashta phase (ca. 2050–1850 BC), and a later Petrovka phase (ca. 1850–1750 BC). Sintashta–Petrovka local communities of nucleated settlements include fortifications with ditches and earth walls, strengthened by wooden and stone constructions. Within settlements, houses are closely packed together in rows or circles in such a way that they share walls. Domestic artefact assemblages do not allow the separation of elites and commoners, even though stratification is visible in burial contexts (Chechushkov and Epimakhov 2018). Potapovka (ca. 1950–1750 BC) appears in the Volga–Ural steppes as a variant of the Sintashta–Potapovka–Filatovka culture, also under strong Abashevo influence. Its main difference with the groups east of the Urals is the lack of fortified settlements, and thus the mobile nature of its economy, probably based on wagon camps. Nevertheless, domesticated animals are the basic diet of all groups, and there is no evidence for the production of domesticated cereals (Hanks et al. 2018). Poltavka and Sintashta–Potapovka share nevertheless almost identical metals, ceramics (both similar to Abashevo), and mortuary rituals featuring horse cheek-pieces, paired horse sacrifices including whole horses, and some new ornaments, as well as very similar metal weapons (such as socketed spearpoints and waisted-blade daggers), which support their close relatedness. Distinct from the previous Poltavka period are the lavish graves, with far richer assemblages, featuring more weapons (Anthony 2016; Khokhlov 2016). Social complexity arose in Sintashta–Petrovka based on herding economy. People who were skilful at managing walled villages, as well as those skilful warriors able to protect from military threats, probably formed the core of the chiefdoms that were created. The majority of the permanent population was involved in craft activities, though, including extraction of copper ores, metallurgy, bone, leather, and woodwork. The most labour-intensive part of the economy was haymaking. Control of craft by clans of miners, metallurgists, blacksmiths and casters also provided a source of power for elites in the fortified settlements. Their highly developed craft allowed for the improvement of the complex technology and substantial resources necessary to build two-wheeled vehicles (Chechushkov et al. 2018). The fortifications of Sintashta represent only a portion of the population (also evidenced by the lack of them in Potapovka), whereas ordinary semi-mobile people, dedicated to herding—the main subsistence economy—inhabited the outside part of fortifications during the winter. This way, herds were grazed during the summer, and protected in portable shelters during the winter, in the best (fortified) spots dominated by the elites. Their activities and lack of rich assemblages suggest a less prestigious status of herders. Kuzmina (1994) cited a connection of the common Indo-Aryan word for a permanent village, grā́mas, earlier meaning a circle of mobile wagon homes, situated together for defensive purposes for an overnight camp (Chechushkov 2018), which is compatible with an evolution of the word from highly mobile herders to its adoption as the designation of a permanent settlement. Elites were imbued of a high social prestige that could be transferred to their children. This is reflected in the elaborate tombs (Figure 82) and sculptures, suggesting supernatural powers and ritual roles as much more important bases of their social prominence than control or accumulation of wealth, which seems nevertheless to have been prevalent within fortifications. Semi-mobile herders possibly represented ca. 30–60% of the population, while the local community represented ca. 40–70%. About 5% of them seem to have had the right to be buried under kurgans, and elites represented no more than 2–3% of the population, based on their extremely rich assemblages (Chechushkov 2018). The social system of Sintashta (and probably also Potapovka) demonstrate a three-part social order, which seems to follow the same order of the Varna system of ancient India (similar also the ancient Iranian system) which consisted of priests (Brahmanis), rulers and warriors (Kshatriyas), free producers (Vaishyas) and laborers and service providers (Shudras) (Kuzmina 1994). In Sintashta–Petrovka chiefdoms, the elite consisted of priests and warriors (2-5%), dominating over local dependent producers (48-55%) and mobile herders (ca. 50–60%) of lower social rank (Chechushkov 2018). Figure 82. Aristrocratic burial at Sintashta in the southern Urals (ca. 2200–1800 BC). The warrior lies in the chariot with solid wheels, beneath two horses accompanied by the groom or charioteer. Image modified from Gering et al. 1992: 154, fig. 72, as it appears in Parpola and Carpelan (2005). This social organisation, apart from being inherited from the similar Late Proto-Indo-European system, was reorganised into a system that favoured incoming Abashevo settlers, who were already skilled craftsmen, and probably emerged as the elite of warriors and priests among leading clans in each fortification. This happened probably during the aridification period and the associated massive migration of Poltavka herders north into the previous forest-zone, and east into the southern Urals, zones which became dominated by Abashevo settlers. To the west, Abashevo influence is felt especially in the eastern part of the Multi-Corded Ware tradition, near the Don–Volga interfluve, which points to the limit of the massive southward migration of Corded Ware-related groups (mostly from Abashevo) into the Pontic–Caspian steppe cultures since the mid–3rd millennium BC. Rituals performed for people of distinctive position have been excavated in kurgans along the Don River within the traditional Abashevo area, in particular the Filatovka and Vlasovo cemeteries, characterised by the composition of elements connected with the Late Catacomb and Multi-Cordoned Ware cultures, as well as to Sintashta and Alakul (Koryakova and Epimakhov 2007). From the social point of view, these Filatovka-like burials display distinctive elements of a system of prestige good and warrior attributes, and have been interpreted as a western ‘back-migration’ of eastern Abashevo groups, as a Potapovka-related version of the Sintashta tradition, or as a component of the Novokumaksky horizon, representing in any of these cases a westward movement of Abashevo-related peoples from the Volga–Ural area. The newcomers possessed a powerful social and political organisation, as well as chariots, and probably encountered Late Catacomb and Abashevo settlers in the Don area. They most likely represent the original population from which early Srubna formed in its Pokrovka (east) and Berezhnovka (west) variants (Koryakova and Epimakhov 2007). The phenotypic change in the steppe during this time is mentioned as the clearest example (since the Neolithic and until the Iron Age) of race—and thus probably ethnic—mixing of heterogeneous groups in Sintashta and Potapovka, compared to Yamna. Some other noticeable phenotypic changes occur related to ‘eastern’ features of the Trans-Uralian steppes arriving in Sintashta, possibly through the Seima–Turbino phenomenon, but also through its expansionist waves to the east (Khokhlov 2016). Pottery, weapons, bone cheek-pieces for chariot driving, and graves of Sintashta style evolved into Petrovka ceramics, weapons, and ornaments, which in turn represent the origin of Alakul (ca. 2000 – 1700 BC), the earliest phase of Andronovo, which was mainly distributed in the whole steppe and forest-steppe of the Trans-Urals and northern, western and central Kazakhstan and Chorasmia (Anthony 2016). Alakul represents thus the expansion of a cattle- and sheep-herding economy everywhere in the grasslands east of the Urals. It continued thus many customs and styles inherited from Sintashta, such as small family kurgan cemeteries, settlements with 10–40 houses built closely together, similar spear and dagger types, ornaments, and the same decorative motifs on pottery, such as meanders, hanging triangles, “pine-tree” figures, stepped pyramids and zig-zags (Anthony 2007). The petroglyph tradition of Andronovo people consists of depictions of everyday life, showing the importance of the wheeled transport (Novozhenov 2012). Bearers of the Alakul tradition assimilated all the Trans-Uralian forest-steppe cultures included in its northern area, evidenced by burial rituals, and in the south it was limited by the steppe zone. Alakul settlements are located on the first river terraces or in the low lake banks, usually close to a large valley, and only rarely on high ground. The biggest settlements are located in the eastern territory, with general settlement surface not exceeding 10,000 m2. Their planning structure is linear, houses organised into one or (rarely) two rows running along the river bank. Houses are rectangular postframe constructions, with internal space divided into partitions, containing wells, storage pits, and fireplaces, including metallurgical furnaces (Koryakova and Epimakhov 2007). Alakul cemeteries involve some dozens of kurgans or multigrave funeral sites with one or two big graves in the centre, and many others in the periphery. They appear in the same area as settlements, without a visible demarcation of the “world of dead” and “world of living”, as in Sintashta. Pottery in assemblages have flat bottoms with a ledge between the neck and shoulder, and their surface carefully treated, with more than half decorated, usually in the neck and shoulder with flat or comb stamps. The dominant burial rite is inhumation. Sacrifices are connected to large burials, and are represented by separate animal bones, usually head and extremities, with a composition similar to Petrovka: first cattle, then sheep, then horse. Dog sacrifices are characteristic of the Trans-Urals region, and fire played a significant role in Alakul rituals (Koryakova and Epimakhov 2007). The Andronovo horizon then included the (at least partially unrelated) Fëdorovo style (ca. 1850–1450 BC), which covered essentially the whole of Turkmenistan and Kazakhstan, connected in the north to the forest-steppe, and in the west to eastern Kazakhstan and the Upper Yenissei. Fëdorovo ceramic and grave types represented an eastern or northern style with which the Alakul style interacted in many regions. Stratigraphic sequences show either Alakul turning into Fëdorovo, or mixed Alakul and Fëdorovo traits, which support the earlier appearance of the Alakul tradition. Alakul showed inhumation beneath earth kurgans, while Fëdorovo showed cremation graves with stone constructions (Anthony 2016). The Fëdorovo shape and ornamentation are nevertheless distinct from the preceding Okunevo culture (ca. 2400–1950 BC), and continue therefore at least in part the Petrovka tradition from the southern Urals into northern, central, and eastern Kazakhstan, to the east into Tian Shan and Xingjian, mostly through the southern Siberia, connected to forest-steppe landscapes. It is found among Alakul sites in eastern Kazakhstan, Altai, and the Minusinsk lowland, and with mixed Alakul appearance in central Kazakhstan. It is also found to the south into southern Turkmenistan, which points to a long-range migration, possibly with the aim of obtaining control of local copper and tin resources, important for the production of high quality weapons (Parzinger 2006). Known settlements are found on the first river terraces, near large river valleys, and can comprise several dozen houses following a linear pattern. Inhabited constructions vary from 30–300 m2, having usually storage pits, niches, wells, and hearths. There are two building types: daylight framework dwellings, proper of central Asia (evidenced by pottery of Namazga tradition), and big, semi-subterranean multiroomed buildings of local origin. Metal objects include socketed arrowheads, chisels, awls, hooked sickles, knife–daggers, etc. and bone inventory include instruments for wool and leather processing, and bone arrowheads (Koryakova and Epimakhov 2007). Kurgan cemeteries, containing dozens to hundreds of mounds, occupy the flat banks of water reservoirs, in contrast to the previously preferred flat terraces. They are usually surrounded by circular or rectangular fences, made of stone by cyst or masonry lying, or covered by an earthen mound along the outer contour. Fëdorovo kurgans are oval-shaped barrows smaller than Alakul mounds but with better expressed relief, containing one rectangular grave pit. Burials include cremation, when the deceased was burned somewhere outside the area and remains and ashes were placed into a grave (Koryakova and Epimakhov 2007). The characteristic Fëdorovo material culture are well-made pots, thin-sided and with a smooth profile, with a technique that involved starting with the body (whereas Alakul vessels were manufactured on a model), with surfaces carefully treated, sometimes polished. The Fëdorovo decorative system, consisting of three zones, was designed according to a canon. Fëdorovo also shows imported central Asian pots made with white or red clay fabrics, largely undecorated, in forms such as pedestaled dishes, which point to the creation of stable, long-range exchange routes (Koryakova and Epimakhov 2007). The expansion of the early Srubna–Andronovo pan-continental, macro-cultural horizon over central Asia (see Figure 83) brought innovations like bronze casting, chariotry, and aspects of pastoral economy and sedentary settlement types (based on year-round residence in timber houses) that connected territories isolated until then. The Andronovo cultural-historical community, or horizon, is the eastern branch of this entity, although mixed Srubna–Alakul settlements are found in the Cis-Ural region (Anthony 2016). Interregional networks include trade of copper, tin, and horses, while material culture shows a patchier diffusion, with differences in rituals and distinctive elite behaviours suggesting also distinct ethnolinguistic groups. In the east, it interacted with north-western China across Tian Shan during the rise of the earliest Chinese state (Quijia, Erlitou, and early Shang periods), and with central Asia during the declining period (ca. 1800–1600 BC) of the BMAC and Namazga VI cultures (Anthony 2016). The idea of simplistic ‘waves’ of eastward movement creating ‘cultural clusters’ is not clear, though, based on the quite early radiocarbon dates from eastern sites of the Fëdorovo type, which may range from ca. 2000 BC. Nevertheless, typological definitions of Fëdorovo can be ambiguous. The long-term localised regional development; the disparate distribution and technological patterns for metal artefacts, ceramics, burial practices and architectural styles; and local variations dependent on specific microregions, all question the validity of a simple demic diffusion model for all Andronovo-type material cultures in central Asia (Jia et al. 2017). Similarly, early Alakul-type funeral rituals included Abashevo elements in the Trans-Urals region, which suggests a multi-ethnic expansion of the culture, supported by the emergence of the Andronovo-like cultural horizon in the Trans-Uralian forest zone (Koryakova and Epimakhov 2007). Continuation of the social organisation based on elites and kinship is reflected in indirect data: while labour invested in funeral rituals is reduced, symbols of prestige (maces, spearheads, axes, and chariotry complexes) maintain a similar trend, and cemeteries suggest a lineage-based organisation: in Alakul, based on the contraposition of central and peripheral burials. Bones of horses are found more often accompanying adults in central graves, while cattle are found accompanying adults and juveniles, while sheep and goats appear with infants (Koryakova and Epimakhov 2007). Andronovo settlements in Kazakhstan were generally larger and more organised than those of Srubna in the Volga–Ural region. Pottery from settlements usually show multiple ceramic phases, interpreted as indicating a cyclical pattern of abandonment and reoccupation. In Andronovo settlements studied to date, the diet was based mainly on sheep–goats and cattle (with conflicting reports as to which predominated in which area), then horses; this suggests a more mobile pastoralism east of the Urals, based at least in part on sheepherding, in contrast to the mainly cattle-breeding economy in Srubna (Kuzmina 2008). While livestock breeding was the main subsistence economy for both Alakul and Fëdorovo, and agriculture was not essential, fishing and hunting (basically elk) played quite a notable role in the northern zone. Around ca. 1400–1200 BC, steppe herders from central Asia were cultivating grain, including pastoralists of semi-alpine pastures of the Karasuk culture in the western Altai. The oldest evidence of agriculture in Andronovo comes from Tasbas in the Dzhungarian Mountains of eastern Kazakhstan This trend continued into the Iron Age (Koryakova and Epimakhov 2007). Metallurgy was quite advanced and concentrated in several centres, whose products were distributed throughout temperate Eurasia. Tin–bronzes are prevalent in Andronovo (more than 90%), contrasting with Srubna (Chernykh 1992) probably due to central Asian tin deposits like those of the Zeravshan Valley near BMAC settlements, and on the middle Irtysh River in the western Altai piedmont near Cherkaskul settlements. Large copper mines exploited during this period include Atasu and Dzezkazgan (Koryakova and Epimakhov 2007). Figure 83. Distribution of the Srubnaya, Alakul Andronovo, Fëdorovo Andronovo and Cherkaskul monuments. Image modified from Parpola (2015): 62 Fig. 7.6, based on Chlenova 1984: map facing page 100. 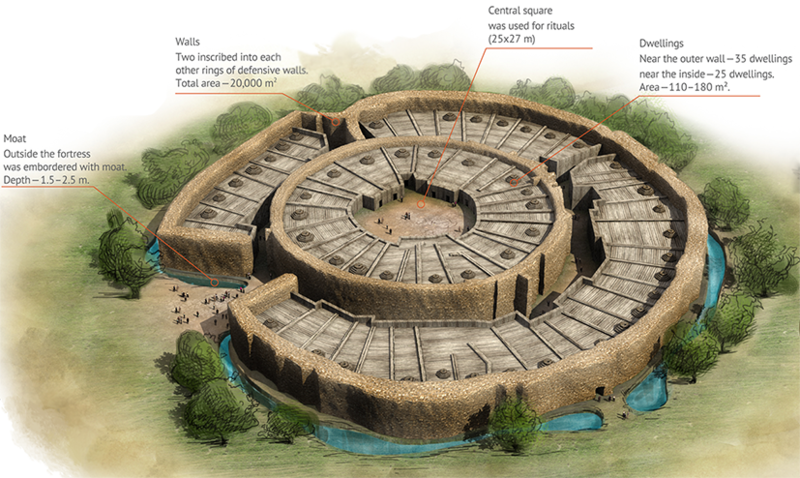 · Rectangular enclosures built using large stone slabs, with a size varying from 28 x 30 m to 10.5 x 4.4 m.
· Almost life-sized anthropomorphic stelae erected along one side of the stone enclosures. 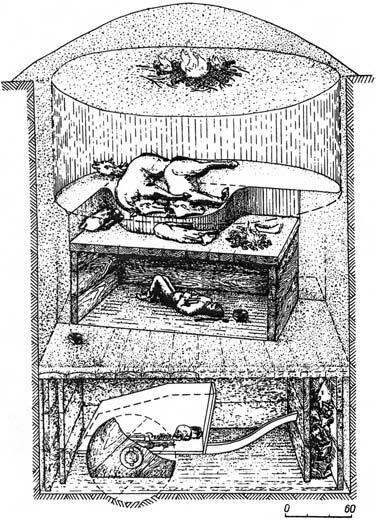 · Single enclosures tend to contain one or more than one burial, all or some with stone cist coffins usually built with five large stone slabs (four for the sides and one on the top), sometimes with painted designs on the inside. · Primary and secondary burials, with two potential orientations (of ca. 20º or 345º), sometimes decapitated bodies (up to 20) associated with the main burial, and bodies placed on the back or side with legs drawn up. · Grave goods include stone and bronze arrowheads, hand-made gray or brown round-bottomed ovoid jars (together with clay lamps) and small numbers of flat-bottomed jars. · Complex incised decoration in ceramics is common, but some vessels are undecorated. · Stone vessels distinctive for the high quality of manufacture. · Stone moulds show a relatively sophisticated metallurgical expertise. · Some artefacts are made of pure copper. · Sheep knucklebones (astragali) imply a tradition of keeping them for ritual or other purposes, indicating an economy based on domestic sheep. Sintashta eventually transformed into the Petrovka–Alakul economy as part of eastward-expanding Andronovo horizon, while Potapovka and western groups evolved into Pokrovka and the expanding early Srubna culture. The identification of Srubna and some Andronovo complex-related groups with expanding Proto-Iranians, and the expansion of Proto-Indo-Aryans coincident with other groups of the Andronovo complex leads to a direct identification of the emergence of Sintashta–Potapovka–Filatovka cultures as the classic Proto-Indo-Iranian community (Anthony 2007; Mallory and Adams 2007; Beekes 2011). This origin of the Sintashta–Potapovka–Filatovka population in Abashevo migrants mixing with indigenous East Yamna and Catacomb/Poltavka herders is evidenced by the intrusive Corded Ware-like ancestry and R1a1a1b-Z645 lineages (mainly of R1a1a1b2-Z93 subclades) in an area previously dominated by Yamna ancestry and R1b1a1b1b-Z2103 lineages. Nevertheless, there seems to be a clear genetic difference between eastern (southern Urals) and western (Volga–Ural) groups coincident with cultural ones (Allentoft et al. 2015; Narasimhan et al. 2018). Four Potapovka samples from the Samara region, from Utyevka and Grachevka (ca. 2200–1800 BC), one reported as of hg. R1-M173, another R1a1a1b-Z645, form a wide cluster between Yamna and Corded Ware samples (Allentoft et al. 2015; Narasimhan et al. 2018). The admixture and PCA shift of Potapovka–Srubna samples relative to Sintashta–Andronovo individuals is compatible with more WHG and less EEF (ca. 28%) contribution (Wang et al. 2019), as found in north Pontic forest-steppe and probably forest samples near the Middle and Upper Dnieper regions. Eight Sintashta–Petrovka individuals from varied settlements of the southern Urals (ca. 2200–1750 BC), one of hg. R1a1a1b2a2-Z2124 from Bulanovo, another R1a1a1b2a2a1-Z2123 from Stepnoe, form a tight cluster close to central European Corded Ware samples (Mathieson et al. 2015; Narasimhan et al. 2018), with elevated EEF ancestry (ca. 42%), which may suggest less admixture of certain eastern Abashevo groups with forest-steppe peoples. Forty individuals from the Kamennyi Ambar V cemetery (ca. 2130–1750 BC) form also part of this cluster, with fifteen samples of hg. R1a1-M459, probably most R1a1a1b2-Z93; two R1b-M343, probably R1b1a1b1b-Z2103; and one I2-M438, probably I2a1b1a2a2-Y5606 (Narasimhan et al. 2018). Ten outliers out of fifty individuals, usually interred on the margins of investigated kurgans, evidence the heterogeneity of the Kamennyi Ambar population, consistent with its interaction with neighbouring populations (Narasimhan et al. 2018). Increased Steppe ancestry is found in four individuals (ca. 2000–1700 BC), three brothers of 1–5 years, moderate outliers, probably of hg. R1a1a1b2-Z93, and one young male, a full outlier clustering with Yamna and Afanasevo, probably of hg. R1b1a1b1b3-Z2106. Ancestry related to Khvalynsk Eneolithic individuals is found in two males (ca. 2050–1650 BC), one of hg. R1b1a1-P297, the other R1b1a1a-M73, without archaeological context (see §ii.3. Indo-Uraliansand §viii.20.2. Yukaghirs). West Siberian Neolithic ancestry is found in four individuals (ca. 2130–1750 BC), one probably of hg. R1b1a1b-M269, two Q1a2-M25, probably related to eastern populations with elevated ‘Siberian’ component, found later in steppe LBA samples. All these outliers with elevated proportions of different ancestries (and direct dates that are contemporaneous with the other individuals) show that this fortified site harboured peoples of diverse ancestries living side–by–side (Narasimhan et al. 2018). Based on later samples from Iranian peoples in the steppes and Indo-Aryans from central Asia, and considering that sampled Sintashta–Potapovka individuals come from fortified settlements and higher status burials (most showing animal sacrifices), commoners of the Sintashta–Potapovka–Filatovka community were probably mainly descendants of Poltavka herders, and thus mainly of R1b1a1b1-L23 and I2a1b1a2a2-Y5606 subclades, whereas elites were mainly descendants of Abashevo migrants, and showed thus an increasing Y-chromosome bottleneck under R1a1a1b-Z645 lineages, in particular R1a1a1b2-Z93 subclades. This integration of Abashevo elites, originally Uralic speakers, among Poltavka herders, of Pre-Proto-Indo-Iranian language, is conceivable in a region of highly fortified settlements, evolving through alliances of different groups against each other, akin to the situation found in Bronze Age Europe: a minority of Abashevo chiefs and their families would dominate over certain successful fortified settlements and wage war against other, neighbouring tribes for control over the best economic areas. After a certain number of generations, where the majority of the population—including commoners, females among the elites, and possibly slaves— retained the original Poltavka culture, the integrated elites would have replaced the paternal lineages of the region. This explains the language shift of Corded Ware lineages from Abashevo in the steppe, and is supported by the archaeological continuity of Sintashta-Potapovka with Poltavka in terms of material and symbolic culture (Anthony 2007). The strong influence of Uralic speakers on Indo-Iranian pronunciation, visible in the characteristic phonetic Uralisms of Proto-Indo-Iranian, have to be put in relation with the strong influence of Indo-Iranian loanwords on northern Abashevo peoples—who probably maintained close contacts with their southern relatives as they became bilingual—visible in Finno-Ugric loanwords (see §viii.15. Permians and Volga Finns). The Andronovo cultural complex represents a complex historical phenomenon encompassing a large number of cultures from the Eurasian steppes, between the Ural Mountains in the west and the Minusinks Basin in the east, without clear ethnolinguistic borders. The most important Andronovo cultures, probably to be identified roughly with expanding Indo-Iranians, are Alakul and Fëdorovo, from central Kazakhstan to the Yenisei river in present-day Russia. Different genetic clusters have been found among Andronovo-related groups (Narasimhan et al. 2018), some of them likely representing distinct ethnolinguistic communities. A common cluster with Sintashta–Petrovka is found in most Andronovo samples of the Trans-Urals steppes (ca. 2000–1400 BC). This “Western Steppe MLBA” cluster shows similar EEF contribution (ca. 26%) and haplogroup distribution. A subcluster of “Eastern Steppe MLBA” peoples is formed by certain samples which show statistically significant differences with the Western Steppe MLBA cluster, consisting mainly of additional West Siberian HG ancestry contribution (ca. 8%), suggesting that peoples of Western Steppe MLBA admixed with West Siberian HG-related peoples as they spread further east (Narasimhan et al. 2018). Western Steppe MLBA samples include, apart from those of Sintashta–Petrovka, mainly samples from Alakul and derived groups: from central-east Kazakhstan, there is one from Ak Moustafa (ca. 1770 BC), of hg. R1a1a1b-Z93; six from Kairan, near the Ak-Koitas and Kara-Koitas mountain in Karaganda (ca. 1930–1630 BC), two of hg. R-M207; seven from Maitan (ca. 1880–1640 BC), including three likely R1a1a1b-Z645; one from Satan (ca. 1780 BC), of hg. R1a1a1b-Z93; one female from Alpamsa (ca. 1550 BC); three males from Karagash (ca. 1880–1600 BC), of hg. R1a1a1b-Z93. Other samples include two from Lisakovskiy, northern Kazakhstan (ca. 1870–1690 BC); six from Oy-Dzhaylau, southern Kazakhstan (ca. 1900–1400 BC), three of them likely R1a1a1b-Z93; one from Solyanka, western Kazakhstan (ca. 1640 BC); and four from Aktogai, south-east Kazakhstan (ca. 1600–1500 BC), three of them hg. R1a-M420, probably R1a1a1b-Z93 (Narasimhan et al. 2018). Other Western Steppe MLBA samples include individuals of the Mezhovska culture (see §viii.20.1. Ugrians and Samoyeds). Eastern Steppe MLBA samples include four from Kytmanovo in the Altai Krai (ca. 1700–1300 BC), one of hg. R1a1a1b2a2-Z2124 (Allentoft et al. 2015); three from Dali (ca. 1900–1300 BC), one of hg. R1a1a1b2-Z93; four from Kazakh Mys (ca. 1730–1530), two likely of hg. R1a1a1b-Z645; one from Zevakino (ca. 2000 BC) of hg. R1a1a1b2-Z93, before the Fëdorovo stage; fifteen from the easternmost area in Orak Ulus and near the Minusinsk Basin in Krasnoyarsk (ca. 1900–1400 BC), with eleven samples of hg. R-M207, ten of them probably R1a1a1b-Z645, including at least three R1a1a1b2-Z93, and a clear outlier from the Orak Ulus site (ca. 2000–900 BC), of hg. Q-M242, clustering with West Siberian Neolithic samples (Narasimhan et al. 2018). Other likely Eastern Steppe MLBA samples include a group north of the Altai (ca. 1800–1400 BC), one of hg. R1a1a-M198 from Oust-Abakansty, Khakassia, one of hg. R1a1a-M198 from Solenoozernaya IV, Krasnoyarsk, and one of hg. C-M130(xC2-M217) from Tatarka cemetery, Charypovsky (Keyser et al. 2009); one from Mityurino in the central steppe (ca. 1590 BC) showing contribution from East Asian populations (de Barros Damgaard, Marchi, et al. 2018). It has been suggested that Afanasevo and Chemurchek find their “missing link” with the migration of Tocharians to the Tarim Basin in the sites of Gumuguo and Xiaohe in the Taklamakan desert of southern Xinjiang, based on the Caucasoid features of the investigated individuals. The finding of haplogroup R1a1a1b-Z645 (xR1a1a1b2-Z93) in 11 out of 12 investigated Tarim Basin mummies of the Xiaohe necropolis (Li et al. 2010), dated probably ca. 1700–1400 BC (Qiu et al. 2014), increases the doubts of the connection of these mummies to Afanasevo on one hand, and to speakers of Tocharian on the other (Mallory 2015). In fact, the penetration of Andronovo cultural influence is found in the western Tian Shan and the Ili River valley, but also further east and south (Kuzmina 2007). If the Tarim Basin mummies actually belonged to ancestors of later Tocharian speakers, this would support a cultural assimilation of Pre-Tocharian peoples into expanding Asian clans of R1a1a1b-Z645 lineages (see above), and also that the migration of the Proto-Tocharian language to the Tarim Basin was coincident with the Andronovo expansion, which “had transformed the steppes from a series of isolated cultural ponds to a corridor of communication” (Anthony 2007). The likely presence of early contacts between Tocharian and Samoyedic (to the north), as well as the especially intense contacts with Indo-Iranian, support the close interactions of these groups around the Tian Shan and Altai mountains during the Bronze Age. Investigated samples of the Sagsai tombs (“Mongun Taiga” culture for Russian archaeologists) from the Altai show an early sample from Takhilgat-Uzuur 5 (ca. 2700 BC), contemporary with late Afanasevo, of hg. Q-M242, with western and eastern genetic components, which supports an early infiltration of steppe ancestry in the region. Later individuals of the Middle and Late Bronze (ca. 1400–900 BC) show four samples of hg. R1b1a1b1-Z93, and three samples of hg. Q1b1a-L54, apart from a late one of hg. C-M130, which supports the arrival of R1b1a1b1-Z93 lineages in the region during the MBA (Hollard et al. 2014). Nevertheless, from the paternal lineages found in modern Uyghurs (Zhong et al. 2013), those of haplogroup R1b1a1b-M269 could be explained only by either Afanasevo or Indo-Iranian R1b1a1b1b-Z2103 lineages. The presence of R1b1a1b-M269 (23%) among modern Yaghnobis of the Upper Zeravshan Valley (Cilli et al. 2019) also support the ancient distribution of this haplogroup in central Asia, potentially related to the Tocharian expansion.